We investigate the performance of frequency division multiplexed (FDM) signals, where multiple orthogonal Hermite-Gaussian carriers are used to increase the bandwidth efficiency. Multiple Hermite-Gaussian functions are modulated by a data set as a multicarrier modulation scheme in a single time-frequency region constituting toroidal waveform in a rectangular OFDMA system. The proposed work outperforms in the sense of bandwidth efficiency compared to the transmission scheme where only single Gaussian pulses are used as the transmission base. We investigate theoretical and simulation results of the proposed methods. As the demand for mobility and high performance in multimedia services increase, efficient spectrum usage becomes a critical issue in wireless communications. Orthogonal frequency division multiplexing (OFDM) is a multicarrier modulation that has been employed by a number of current and future wireless standards including a/g, a-d, long term evolution (LTE) downlink, and next generation networks. OFDM has been a popular method because of its robustness in frequency selective fading characteristics of broadband wireless systems. OFDM technology transmits data by dividing it into parallel streams to be modulated by subchannels each having a different carrier frequency. Basically, data is carried on narrow-band subcarriers in frequency domain and the carrier spacing is carefully selected so that each subcarrier is orthogonal to the others. There have been numerous studies in the literature to provide efficient spectrum usage in high-performance wireless applications, including video streaming [1, 2]. Different coding methods and modulation types are developed for this task, such as hexagonal QAM structure [3, 4]. In , linear combinations of Hermite-Gaussian functions are used in the generation of two orthogonal pulse shapes to increase the system throughput. However, such a linear combination increases the bandwidth of a single subchannel significantly. Pulse shape design is an important research issue because of the corruption eects of channels, such as Doppler shifts, fading, and noise. Conventional OFDM uses rectangular-pulse shapes for each data. Since this pulse shape has sinc shape in the frequency domain, its energy is dispersed to other subcarriers when the channel is dispersive. For this purpose, there is a ceaseless pursuit for dierent pulse shapes. Nyquist pulses with raised cosine spectra, Hermite-Gaussian functions based pulses [5, 6] and an optimized combination of Slepian sequences [7–9] have been investigated in the literature. In , prolate spheroidal wave functions (PSWFs) which have maximum energy concentration within a given time interval are used to design a time-frequency division multiplexing (TFDM) system for multiple users. If the transmitted pulses have maximum concentration on the joint time-frequency (T-F) domain, then the transmitted signal shall be preserved against the channel affects better. Intersymbol interference (ISI) and inter-carrier interference (ICI) are the main problems of OFDM systems. When the transmission channel is time and frequency dispersive, the transmitted signal spreads in both domains. Thus symbols corrupt each other. 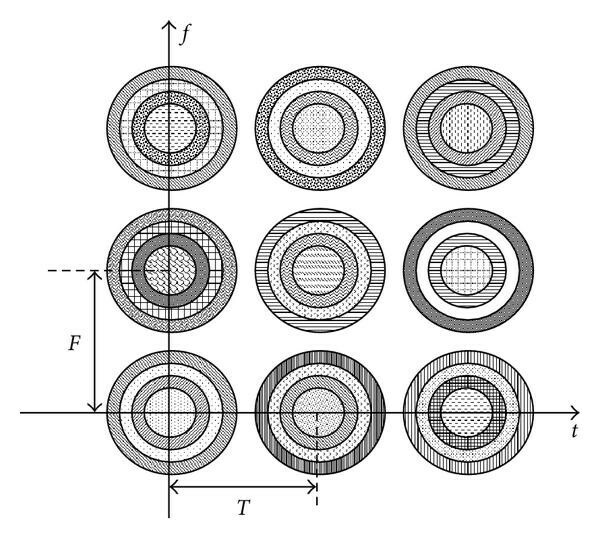 To avoid ISI and ICI, pulse shape design and hexagonal lattice structures are introduced. In a hexagonal lattice structure, time and frequency distances are increased, so the spread signal may not be affected by the other symbols. Ambiguity function (AF) is also a useful time-frequency tool to analyze ISI and ICI which provides us to observe pulse spread both in time and frequency due to the channel effects [10, 11]. In [5, 6], a linear combination of Hermite-Gaussian functions is optimized to construct a desired pulse shape against the Doppler affect. In , Hermite functions are used in UWB communication systems with different modulation types such as PPM, BPSK, and pulse shape modulation. Linear combinations of Hermite pulses of orders to are obtained to construct a single pulse shape which obeys FCC constraints in . In this work we propose a toroidal waveform in a rectangular lattice structure to increase the data rate by providing spectrum efficiency. We use a Hermite-Gaussian function for each data to transmit and combine N of them to form a symbol. Figure 1 presents the general framework of the proposed system. For example, assuming a BPSK modulated data set , the proposed algorithm generates a pulse , where is the th order Hermite-Gaussian function. As Hermite-Gaussian functions are orthogonal to each other, the demodulation process is carried out easily. The proposed system model. Hermite-Gaussian functions are combined to form each symbol. Hermite-Gaussian functions possess doughnut-shapes on the time-frequency plane. Hence, the algorithm constitutes a toroidal waveform structure on the time-frequency plane. Figure 2 presents the waveform of the system in time-frequency plane for the baseband transmission. The figure shows time-frequency regions are occupied by Hermite-Gaussian functions of orders . Therefore, linear combinations of them at different orders constitute a toroidal structure. 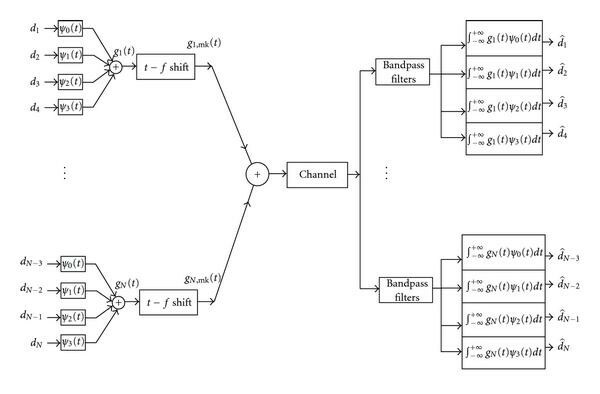 Afterwards, we shift the baseband structure in both time and frequency to obtain the rectangular OFDM structure. Consequently, we investigate the bandwidth efficiency of the proposed system. Toroidal-lattice structure model of a baseband transmission signal. The remainder of this paper is organized as follows. In Section 2, a preliminary is given about Hermite-Gaussian pulses and their time-frequency localization. System model and the receiver part are described in Section 3. The simulation results are discussed by presenting both SNR versus BER values for different overlapping percentages of the signal waveforms on the lattice form in Section 4. Finally, conclusions are drawn in Section 5. Figure 3 shows , , , and , respectively. 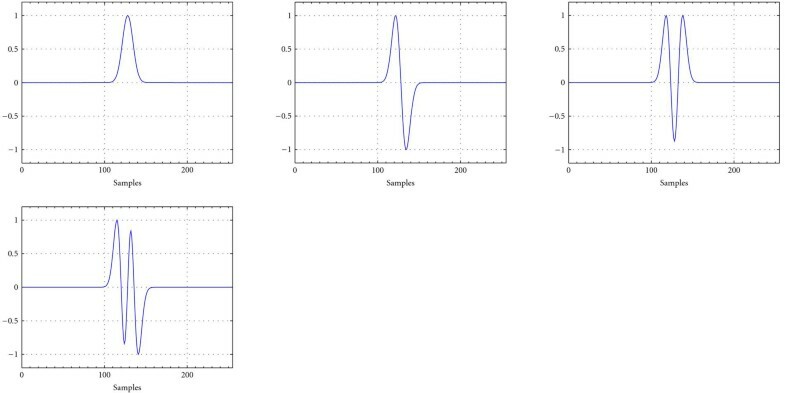 (a) 0th-order, (b) 1st-order, (c) 2nd-order and (d) 3rd-order Hermite-Gaussian pulses in time domain. The zeroth-order Hermite-Gaussian function, or equivalently the conventional Gaussian function, is the best localized function in both time and frequency domain having the lowest TBP equal to . where and are frequency and time shifts, is the order of Hermite-Gaussian pulse, and is the modulated data. Without losing generality, we use different Hermite-Gaussian functions of orders , and for practical considerations and for simplicity. For example, as the order of Hermite-Gaussian functions increase, the sampling rate should also be increased due to the highly oscillatory behavior of higher-order Hermite-Gaussian functions. Figure 4 shows an example of the proposed toroidal-rectangular OFDM lattice structure. The overall structure is an rectangular lattice with each rectangle sheltering four toroidal regions. For this example, there are nine different rectangular time-frequency regions including an additional four different toroidal regions in each rectangle as a total of regions. This means that in a unit rectangular time-frequency region, the system transmits four different modulating data, which makes up a data set for a single time-frequency region. Apart from the conventional Weyl-Heisenberg system, the proposed algorithm produces pulses according to the data to transmit. Namely, in case of a BPSK system if the data to be transmitted is , we produce , otherwise we produce and add these functions to the other Hermite-Gaussians constructed similarly. For example, let us assume a BPSK data set to be transmitted in a single rectangular region. First, = , is produced in the baseband. Then is shifted in time and frequency as , where and represent time and frequency shifts, respectively. The algorithm transmits four data symbols simultaneously in a unit time-frequency region, so we increase the data rate carried in a single rectangular region four times, but it is obvious that the bandwidth of rectangular regions increases. In the following proposition, we show that the bandwidth of these rectangular regions increase approximately times, which means that the bandwidth efficiency is increased up to times compared to the single Gaussian pulse used as a transmission basis in a T-F region. As we pointed out earlier Hermite-Gaussian signals have the lowest TBP. Toroidal-rectangular OFDM lattice structure. Here, F: frequency shift, T: time shift. TBP of linear combination of Hermite-Gaussian signals of order to is times greater than the zeroth-order Hermite-Gaussian signal. Consequently, we observe that the toroidal signal covers a time-frequency region of times the region of pulse. However, since we transmit four pulses at a time we increase the bandwidth efficiency by times. Figures 5(a)–5(d) show the WD of zeroth, first, second, and third-order Hermite-Gaussian functions, respectively. Note that Figure 5 shows time-frequency representations of Hermite-Gaussian functions, whose time domain representations are plotted in Figure 3. 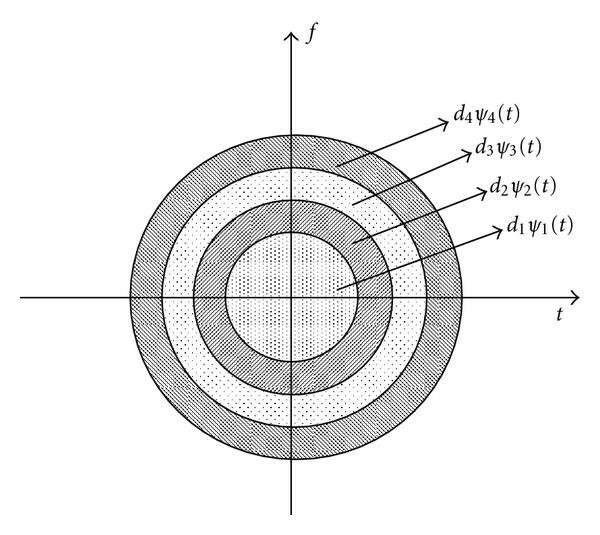 Also, it is clear that the rectangular-toroidal structure in Figure 4 is formed by the weighted sums of the Hermite-Gaussian functions with respect to the transmitted data. AF is calculated by taking the 2-D FFT of the WD. As Hermite-Gaussian functions are symmetric both in time and frequency, AF of these signals are equivalent to their WD's. WD of (a) 0th-order, (b) 1st-order, (c) 2nd-order and (d) 3rd-order Hermite pulses. where , , and represent path number, Doppler spread and delay, respectively. In simulations, both AWGN and Rayleigh channel models are considered as the channel effect. Hermite-Gaussian functions and their linear combinations are orthogonal to each other. Thus, their time and frequency shifted versions are used in the proposed OFDM system simplifying the detection process. In this study, the aim is to increase the system throughput by constructing a toroidal waveform in a rectangular lattice structure. For this purpose, different orders of Hermite-Gaussian pulses are BPSK modulated and they are added together to generate the transmitted signal. The toroidal pulse is shifted in both time and frequency to construct a rectangular Weyl-Heisenberg system. We choose the SNR range within dB and the average of Monte-Carlo iterations performed in all analyses. BPSK modulation is used for the sake of simplicity. If we choose another modulation type such as M-QAM or QPSK, we may increase the throughput more. However, we do not overly concern ourselves with the modulation algorithm, since our purpose is to show the performance of the toroidal system. To examine the performances of different orders of Hermite-Gaussian pulses, we have used each individual Hermite-Gaussian as a single transmission pulse. 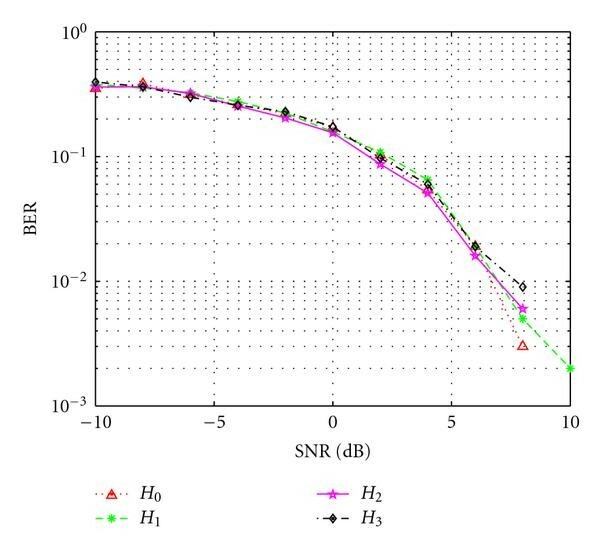 Figure 6 presents the BER versus SNR curves for different orders of Hermite-Gaussian signals. Each Hermite-Gaussian signal's SNR versus BER performance is approximately equal to other ones. BER versus SNR for Hermite-Gaussian signals with zero to three order. The performance of the proposed system is investigated for different time distances between toroidal waveforms. We define an overlapping-pulse ratio (OPR) between adjacent pulses as the percentage of the overlapping pulses. It can be seen from Figure 7 that as the time distance is increased, or equivalently OPR is decreased, the system performance is increased. If two symbols overlap, data rate increases and the bandwidth is used more efficiently, but the system becomes more vulnerable. We have generated overlapping pulses to test how robust the proposed system is. The maximum overlap value to perfect recovery of data at the receiver is found to be in a noiseless environment. 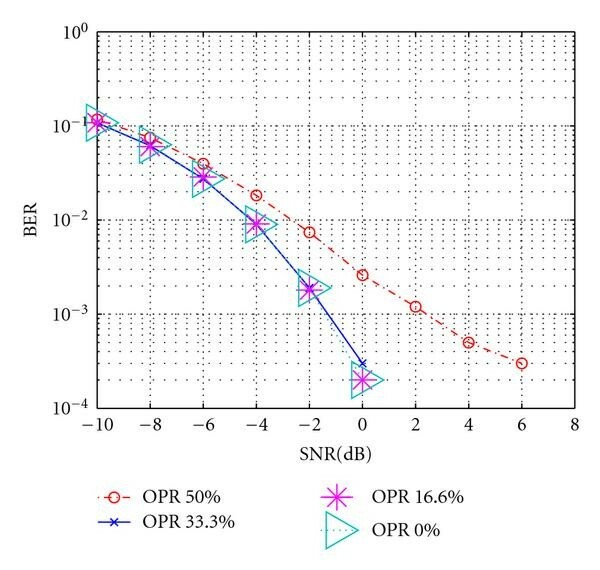 Figure 7 presents the BER performance versus SNR of the system for different OPRs. As OPR decreases, the system performance increases. However, when OPR is small the system performance does not alter very much. We also simulate the system performance in a Rayleigh channel when the Doppler frequency is Hz and OPR is . BER versus SNR with different time shifts. 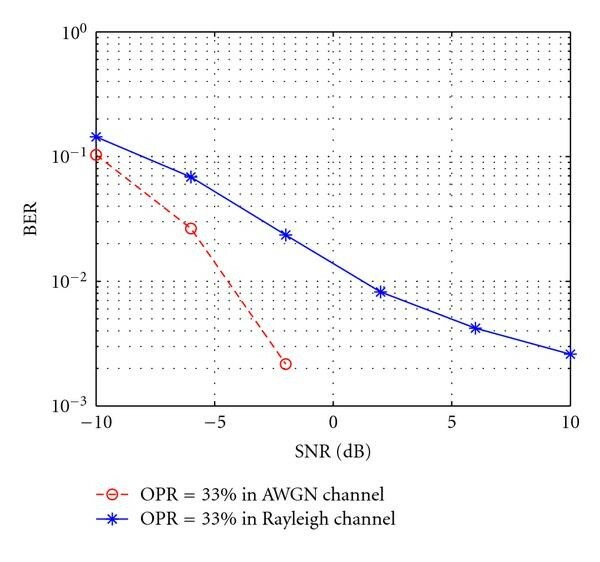 In Figure 8, BER performance versus SNR in both Rayleigh-fading and only-AWGN channels are shown. Only-AWGN channel is approximately dB better than the Rayleigh-fading channel at SNR = dB in the BER-sense. BER versus SNR for Rayleigh and AWGN channel. We have proposed a new toroidal waveform in a rectangular-lattice OFDMA structure. The system includes N different-order Hermite-Gaussian pulses. Each of these pulses is modulated by different data, and they are combined together to construct a toroidal structure which increases the data rate up to N times. However, in case of a four-layer Hermite-Gaussian toroidal structure, as the third-order function covers almost twice the TF region compared to zeroth-order one, the overall data rate increased more than twice. As part of future works, system robustness against doubly dispersive channel effects and ICI will be investigated. The authors are supported by the Scientific and Technological Research Council of Turkey, TUBITAK under the grant of Project no. 105E078.